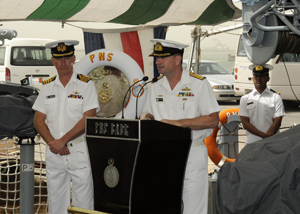 Commodore Mukhtar Khan, Pakistan Navy, relieved Commodore Jonathan Mead, Royal Australian Navy, as Commander, Combined Task Force (CTF) 150 (counter-terrorism), during a change of command ceremony onboard PNS Badr, Mina Salman port, Bahrain, April 17. 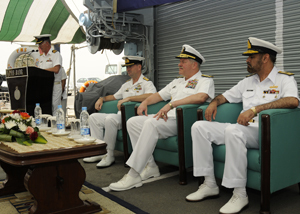 From right, Pakistan Navy Commodore Mukhtar Khan, U.S. Navy Vice Adm. Mark Fox, Commander, Combined Maritime Forces (CMF), and Royal Australian Navy Commodore Jonathan Mead listen to opening remarks at the change of command ceremony. The ceremony concluded the Royal Australian Navy’s third command of CTF 150, a multi-national task force that conducts maritime security operations (MSO) in the Gulf of Aden, Gulf of Oman, Arabian Sea, Red Sea and the Indian Ocean. Royal Australian Navy Commodore Jonathan Mead speaks at the change of command ceremony. Commenting on the success of CTF 150, Commodore Mead highlighted the recent $5 million drug seizure by HMAS Parramatta in February and the $22 million drug seizure by HMS Westminster in April. By coordinating with the ships in CTF 150, from five different navies, as well law enforcement agencies and coast guards, more than 400 kilos of illegal narcotics was located and destroyed from both incidents. This will be the sixth time command of CTF 150 has been held by the Pakistan Navy, who have also held command of CTF 151 (counter-piracy) three times. The 25 personnel team will be based in Bahrain. 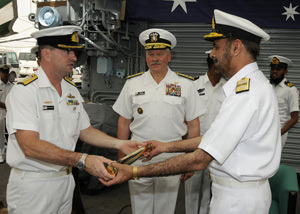 Royal Australian Navy Commodore Jonathan Mead, left, symbolically hands over command to Pakistan Navy Commodore Mukhtar Khan during the change of command ceremony. CTF150 is a sub command of the Combined Maritime Forces (CMF) and exists to create a lawful and stable maritime environment free from terrorism, smuggling and other illegal activities across an area of two million square miles, covering the Red Sea, Gulf of Aden, Arabian Sea, Indian Ocean and Gulf of Oman. 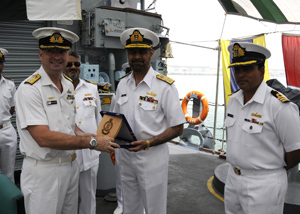 Royal Australian Navy Commodore Jonathan Mead, left, holds a gift presented to him by Pakistan Navy Commodore Mukhtar Khan.